Breaking barriers. 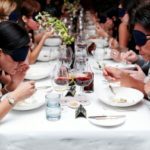 A dinner served in the dark or with blindfolds where the participants can’t see each other. Conservations without prejudice, then the lights come on, and desert and you can see who you were talking to. Lowell Association for the Blind has a similar annual dinner, this could expand on their good work. Break barriers of preconceived notions of differences. We will learn we are more alike than different. 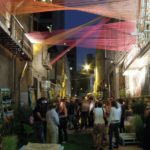 The long alley between Merrimack street and Middle street could be separated into sections and local artists would use each section for his/her own art. We could string Christmas Lights, lanterns, or other lamps over the alley. This could be a temporary exhibit, with an opportunity to be permanent if there is community buy-in. It would encourage people to walk the alley and it would keep the graffiti down. Bright spot for an urban setting. Arches denote passage to another place. Belvidere, Downtown / JAM, OldIdea. 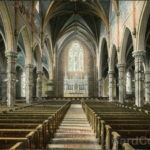 There are some incredibly beautiful houses of worship in Lowell, as a pilot project why not document the magnificient houses of worship in the Acre and the Highlands through photographs and do a brochure and perhaps a tour? There are some incredibly beautiful houses of worship in Lowell, but few outside of individual congregations know what is hiding behind the walls of those institutions. Better understanding grows out of familiarity . . .
What if we could get permission from the city to let artists in the downtown area paint footprints on sidewalks, benches, and other items forming a footwalk to art venues in the area? This would bring additional exposure to downtown restaurants and to Lowell's underutilized canalside space. It might inspire more use from the former Sun printing building. 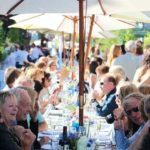 People may try a new restaurant if it's in a fun new context and want to visit their bricks-and-mortar establishment if they like it. Choose a large public space/wall, perhaps empty/abandoned buildings or fences. Paint the wall with blackboard paint. Have chalk available. 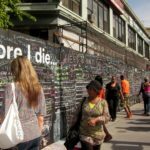 People write one sentence: “Before I die I want to…” (fill in the blank). 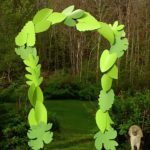 Get everyone together to an event with foam, hot glue, small plastic toys. 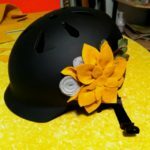 Families work together with their kids in creating fun and colorful bike helmets. Could take place at Western Ave Studios or another place. Increased visibility and safety for kids on their bikes.